The work at Brockley began sometime in the spring of 1841 when the chapel was built. There had been meetings held in private homes prior to this led by itinerant preachers from Garland Street, Bury St Edmunds. The chapel site was given by a wealthy landowner called Mr Bevan and he also lent them free of charge the money with which to build. Cornelius Elven (1797-1873), the pastor of Garland Street Chapel at Bury St Edmunds came regularly to preach and also baptised several at Brockley in a nearby moat. It seems the first Pastor a Mr Dallison came in the first place as a kind of Moderator from the church at Glemsford. Thomas Marsh and John Maulkin were appointed the first deacons. Mr Dallison was received into membership in 1845 and the minutes record our ‘minister’ concluded with prayer. There is however no record of either his welcome or induction. In that same year Norton and Sarah Hurrel were appointed to collect the weekly and quarterly subscriptions. In September 1845 mention is made of the Sunday School, when ‘Brother Dallison engaged to superintend the school and brethren Marsh and Garwood, with Susan Hurrel engaged to fetch the children.’ So from its formation there was a deep concern for the spiritual welfare of the children and this concern has run through the whole history of the church. However, in June the church met and decided unanimously to meet once a month for prayer. They also invited brother Dallison to continue his labours as minister. In August 1852 the fees were minuted for the burying ground. The charges being 5 shillings for six feet, 3 shillings and sixpence for some indecipherable specification and the same for children. In March 1853 the burial ground was re-dedicated to the members, their children and the current attendance. At the church meeting of March 26th 1854 it was unanimously agreed to ‘subscribe and to collect, for purchasing the place in which we have long met and now meet for public worship.’ In June that same year 12 people are named as trustees of the chapel. It was in this year they were asked to begin a payment of £5 per year interest on the money that thirteen years before had been lent them to build. They were informed they could clear the debt for £100. They resolved to do this and borrowed £40 from the Baptist Building; Fund and the deacon Thomas Marsh undertook to collect the rest. This involved him walking many miles and included a journey to Croydon accomplished mostly on foot to request a donation from a relation. They raised the money and paid off the debt on the chapel. On July 22nd 1856 Mr Cornelius Elvin preached at the Anniversary meetings and over 160 sat down to tea. In January 1857 it was agreed that a change of Pastor was desirable and that Mr Dallison would be free to serve other churches, so the first pastor of Brockley concluded his ministry on Good Friday April 10th 1857. A Mr Kemp from Hadleigh preached for two Sundays, His preaching was with power and very acceptable to the people. After due consultation and much prayer Mr. Kemp was asked to preach with a view to the pastorate, and on June 26th that same year he began his labours at Brockley. By 1858 the congregations had grown sufficiently for it to be necessary to add a gallery to the chapel. This was done at a cost of £26. On April 20th 1862 it was stated by the minister that the chapel was now free from debt, so there was great rejoicing and the doxology was heartily sung. There were at this time a number of baptisms but for some reason these services were conducted by a Mr Borret. The Chapel House (now Suffolk Cottage) was built in 1862 and Pastor Kemp moved into this house as the first full-time pastor. In December that year it was agreed to collect and send a donation to the ‘starvation over in Lancashire’. On June 21st 1863 Mr Kemp preached his farewell sermons concluding a ministry that had been greatly used of God to the building up of the church. A cloud was hovering over the church at this time and in February a meeting was called to dismiss from their membership Mr Samuel Seely the book keeper and Mr Alfred Nunn the treasurer for defrauding the church of 27 shillings. There is very little information recorded for the next forty years, but in that period Mr Abner Morling, Mr Rumsey and Mr J.W. Saunders served the church as pastors. In 1906 the church, being without a pastor, heard of the resignation of Pastor A.J. Ward of Laxfield and approached him with an invitation, which he accepted. In accepting this call Pastor Ward expressed the desire ‘that it might prove to be both a pleasant and fruitful one, with God’s signal blessing upon it.’ On January 27th 1907 he began his ministry which was to prove just that. In February 1910 mission services were held by a former pastor, Abner Morling of Stoke Ash. All meetings were well attended. Similar meetings were held again the following year with the same speaker. The offerings from the Harvest Thanksgiving services of September 22nd 1912 were divided between the South India Mission Society and the West Suffolk General Hospital in Bury St Edmunds. Later in 1926 the harvest thanksgiving offering was given to the British Red Cross and a fund for those from Suffolk who had been prisoners of war. In early July that year it was suggested that owing to the very weak state of health in which the Pastor was, that he take the rest of the month off. But owing to the slow progress he made it was decided this be extended to the rest of August. He was back in harness in October when he was asked to write a letter of sympathy to Pastor C.T. Dykes on the death of his wife. However a special minute recorded for January 20th 1922 states, ‘On Lord’s Day January 20th our beloved Pastor Andrew James Ward completed 15 years of faithful ministry among us. Grave illness supervened before the next Lord’s Day and on February 3rd he departed to be with Christ. His health had been frail for some time previously, necessitating suspension of all pastoral duties for two months, July and August. After which he went on perseveringly until the call came to exchange earth for heaven, and the influence of his gentle, peace-loving spirit will long be felt among us’. At the Harvest Thanksgiving that year Pastor R. Mutimer of Brentford was the speaker. Both he and his son Benjamin were frequent preachers at Brockley. It was not surprising that at the March meeting of 1924 it was announced that following a unanimous invitation to the pastorate, Benjamin Mutimer had accepted. At this meeting Brother Marsh spoke of the wonderful way in which both pastor and church had been led to each other. It was also stated they were having difficulty finding a suitable house for the pastor. The members were asked to earnestly pray that God would undertake for them in that respect. On May 27th the welcome meetings were held for Pastor & Mrs. Mutimer. The pastor’s father Pastor Robert Mutimer was the afternoon speaker. He also chaired the evening service, when Pastors Everett (Glemsford) L.R. Garrard (Bradfield St George) and A.M. Morling a former Pastor were the speakers. Mr J.J. Marsh stated his wish to resign after 40 years as the Church Secretary. A committee of men and one lady was formed to deal with this work. Owing to a deficit in the finances it was agreed an offering would be taken every Sunday morning and not just one per month as had been the practice. It was also agreed that Church meetings would in the future be quarterly and not monthly. In December that year four others were appointed as trustees. At the same meeting it was stated that due to the generosity of Mr. B.B. and Mrs. Marsh the mission hall at Rede had been purchased. On December 23rd 1924 at a church meeting to hear the testimonies of candidates for membership and baptism, one of the candidates Miss Violet Bacon testified to the blessing she had received from the preaching at Rede. Thus the Lord set His seal upon this new venture. In June 1929 the question arose as to whether the church should join the Suffolk & Norfolk Association of Strict Baptist Churches. This however was deferred for a time. Mention was also made of a mission work at the hall in Hawstead, though there is no mention as to when this work may have started. The October balance sheet showed a balance in hand of sixpence ha’penny. This balance by January 1930 was reduced to three farthings. The ministry of the Pastor was being greatly blessed as there were continual baptisms at this time. In January 1931 it was unanimously decided to join the Association. On June 21st the Sunday School Anniversary was held again the Pastor preaching to large congregations at all three services. This was followed on the 23rd by their outing to Clacton when a fine day was enjoyed by all. In 1935 rules for church discipline were introduced. In April 1936 the Pastor felt his only course was to resign. This was received with much regret, he was asked to stay on till the last Sunday in September which was the harvest thanksgiving. In July 1937 it was decided to ask the Association to become trustees of both the Chapel and the Rede Mission hall at a cost of £6 7s 0d. At a church meeting in May 1938 mention was made of Mr A.J. Wade a young man in membership at Blakenham who had been a frequent, preacher, as a possible pastor, many bearing testimony to blessing received under his ministry. This was put to the vote resulting in an unanimous invitation being given to him and his acceptance. The welcome meetings were held on July 14th. At his first church meeting Pastor Wade agreed to take up the work of ‘Open Air’ at Brockley, Rede, and Hawkdon. Evangelistic services were held from January 31st to February 2nd conducted by Pastor G.F. Staddon. In April the Pastor brought before the church the need for a ‘Men’s Convenience’ as evidently none had been provided before! At the outbreak of war consideration was given as to ways of saving on fuel and also as to the blackout that was required. Much discussion took place and it was agreed that there should be morning and afternoon services instead of the morning and evening. This however was not a success and soon blackout was provided for the Chapel and the evening services were resumed. It was also decided at this time that the Sunday morning service once a month should be devoted to prayer for the Nation. This was later altered to being held from 9.40 – 10.20.am. every second Sunday in the month. In 1940 renovation was much needed on the Rede Mission Hall but owing to war restrictions on building this was deferred until after the war. In February 1941 it was decided as the Pastor was receiving a grant from the Strict and Particular Baptist Fund a collection should be taken for it’s support. Centenary Services were held on May 28th 1941 the afternoon speaker was the former Pastor, Pastor B. Mutimer. The evening meeting was presided over by the pastor with Pastors L.R. Garrard, C.T. Dykes and B. Mutimer as the speakers. In spite of it being war time an excellent tea was provided, and though the weather was very bad good congregations attended, the offerings amounting to £10 15s l0d with a profit from the tea of £2 10s. It had previously been decided these collections be forwarded to ‘Bombed Churches of our Denomination’, to show their thankfulness to God for preserving their church building. In 1943 a letter was sent to those friends Mrs Reynolds of Whepstead, and Mrs Borham of Hawstead thanking them for the use of their cottages for village station work. The work at the Mission Hall at Rede was reviewed as support there had somewhat depleted. In July the wear and tear required the blackout shutters to be renewed. On March 19th 1944 the Pastor stated he had received and accepted a call to the Church at Ramsey (Hunts. now Cambs) and so asked the church to release him. His farewell service were held on June 21st the speaker being Pastor Wayman. In 1945 it was agreed that on the day war finished there would be an evening service for prayer and thanksgiving there is no record as to whether this did or did not take place. However it was decided to remove the bomb blast preparations from the windows. In May 1946 it was felt a Sunday school room was needed as when the people came in for the morning service the children were distracted and a fund was opened called ‘The Brockley Sunday School Fund’. Three special services were held on June 3rd, 4th, and 5th, conducted by Pastor F.C.M. Reed of Grundisburgh on the ‘Deepening of the Spiritual Life’. In July that year it was decided to suspend the Sunday School at Rede as only 3 scholars were attending and two of these were scholars at Brockley. In April 1947 a special church meeting was called to consider the pastorate. Pastor Reed had been a visiting preacher on several occasions, his ministry was very acceptable and had been blessed to the church and so his name was brought as a suitable pastor. A vote was taken with 31 in favour and 3 remaining neutral. An invitation was given to Pastor Reed, which he at first declined, but after further discussion and prayer and meetings with the deacons he accepted it believing it to be the will of God. It was agreed his pastorate should begin in April if the manse was vacant. At the annual church meeting of January 1948 it was agreed to take an offering during the service instead of holding the bags at the door. On April 4th Pastor Reed began his ministry and although the weather was not favourable the congregations were very good. He did have to travel from Grundisburgh for a time as the manse was not yet vacant. In 1948 permission was sought from the deacons to buy a piece of land on which to build a new Manse if they saw one. In 1949 the Sunday School at Rede was recommenced. In 1951 at the annual church meeting the pastor said he had seen Mr Clarkson of Speeds Farm and he had offered to give a piece of land adjoining the graveyard which would be suitable for a Sunday school room. This offer was gratefully accepted and a letter of thanks was sent to Mr Clarkson. A tent mission in connection with the Home Mission was arranged for 10 days starting May 8th 1952. A new venture in this year was a Thanksgiving Day. The speaker was the Rev Leslie Long of Felixstowe and the amount given was £37. 15s. 5d. This was such a success that it was agreed to continue these services with an afternoon service as well. The next year however was not such a success as the weather was bad and the preacher engaged could not get through, so Pastor Reed had to step into the breach. The offerings amounted to £26. 15s. 9d. The Good Friday services in 1955 saw the switching on of electricity which had been connected to the chapel and manse for the first time. On Easter Sunday 1969 Pastor & Mrs. Reed were presented with an electric convector heater on the occasion of their 21st Pastoral Anniversary. In 1972 it was agreed to buy a piece of land adjoining the graveyard for £150 being offered by Mr Clarkson. The Pastor had not been in good health for some time and it was agreed that supplies should be made for one Sunday per month. In 1973 a special church meeting was called regarding an extension to the premises for the Sunday School. It was suggested a prefabricated building be explored for placing on the south side of the chapel replacing the vestry window with a door. It was 27 years. A farewell service was held on January 4th 1975 the church being crowded for the occasion. Pastor Stockbridge agreed the venture should go forward plans were submitted and permission given. By October it was erected and a carpet was laid and 30 second hand chairs were purchased. A feature of these times were the open air services being held every summer. In November a special service of thanksgiving for the new extension and for a car park were held, the speaker being Pastor A.J. Wade. At the annual meeting of January 1974 the Pastor stated that owing to continued ill health he did not know how long he could continue in pastoral duties. The church was very sympathetic and asked if possible he could carry on until the following January, though no pressure was put on him the decision was entirely his. If he felt he must give up, the Manse was available for him to remain. They felt if a new minister was called the Lord would make provision. This gesture showed the respect in which the pastor was held. It was also decided at this meeting that the telephone should be installed at the manse at the church’s expense. In December that year a united service of 9 lessons and carols was held with the Anglican friends, this proved to be a very happy occasion and one that was to continue. In April that year the pastor tendered his resignation. He felt that due to his health he must resign, this was received with much consideration and feeling with deep regret. He proposed to finish his duties the end of December which brought to a close a very blessed and fruitful ministry lasting for e chaired the meeting and the guest speaker was Pastor G.E.J. Bird. Mrs. Reed was presented with a leather handbag and a carry all to match. Pastor Reed was presented with a cheque for £150. The offering of £130 was also given to them. Pastor Reed continued to conduct the prayer meetings and the services at Rede for a time. In 1976 Grace hymn book was used for the morning services and • at the discretion of the preacher for the evening services. In May the deacons asked that the church be much in prayer both in private and public concerning the pastorate, although at this time they had no recommendations to make. Pastor John Skull was asked to become the Moderator during the pastorless period. In 1984 it was stated the old manse had been sold and a new one at no 4 Woodcroft had been purchased. In 1985 it was agreed to discontinue the services at Rede. In April after hearing Mr. Simon Ladd the church and congregation met to discuss inviting him to the pastorate. As a result the invitation was given and after meeting the deacons he accepted. In July it was agreed to sell the Rede Mission Hall. There is no record of the welcome meetings for Pastor Ladd in the minutes, but they were reported in both the East Anglian Daily Times and the Bury Free Press. He began his ministry and conducted his first church meeting on October 1st. In 1988 the Pastor invited the church to seriously consider and pray about the subject of deacons and elders. The church’s 150th anniversary was held this year with a tent being erected in the village and a mission being held from May 29th to June 1st. At the July 1991 church meeting Mr E. Underwood, Mr J. Reed and Mr B. Watson were recognised as elders. In 1992 it was suggested plans be submitted to the authorities for permission to extend the premises. The elders after much prayer and thought were in favour of a more open approach to the Lord’s Table, but felt this was not an issue that warranted leaving the Association as the Association had not reached a decision on the issue. It was however left for further discussion after the Association had given some guidance. 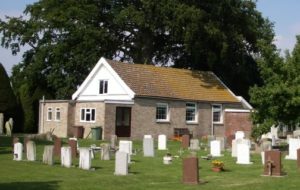 In July it was decided to proceed after much discussion with the plans for extension on the south side of the graveyard. In 1993 at the annual church meeting the Pastor gave his resignation. This resignation was received with much regret, yet in praise to God for the blessings received. At the April meeting it was decided in view of this to postpone the extension plans. The farewell services were arranged for July 24th 1993.